If you’re looking for a fun activity to do with your dog this summer, consider taking them on a water adventure! This could be letting them swim in a local pond, taking them to a lake, or taking them with you to the beach. If your dog loves the water there’s more you can do with them than just allowing them to swim. For example, you can take them paddleboarding with you. Paddleboards are large enough that most dogs will be able to comfortably sit on it with you paddle along in the water. This gives you the chance to enjoy the beauty and tranquility of nature on the water with your dog. Similarly, you also might consider taking them whitewater rafting, kayaking, fishing, canoeing, sailing, and/or surfing. With any water activity you take your dog on, it’s important to remember that dogs aren’t natural swimmers, so it might be a good idea to consider getting them a protective flotation device. Dogs are a great companion to take with you on a trip. You and your dog could go on a trip somewhere new and discover all the new adventures and marvels a new place has to offer. If your dog likes going for long walks, maybe consider going somewhere a little excluded that has plenty of nature trails for you both to explore. You might enjoy taking a trip to mountains or woods. Not only is this a great way for you to disconnect from your busy everyday life, but it’s also great to provide your dog with some beautiful, new scenery. Especially if your dog is curious and likes to adventure, they will love being taken to a whole new location for them to discover. Going on a trip doesn’t mean you have to go far away either. 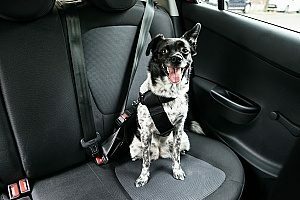 Your dog will love going to new places! You could take them with you to a local farmers market, to a pet store, or maybe even take them with you to a restaurant with patio seating that is dog friendly. The options are truly endless and your dog will surely love whatever new place you take them to. An activity that is not only great for you and your dog, but also helps others, is to volunteer and a local hospital or nursing home. You and your dog can go together to visit patients and spend time getting to know them. Dogs are very soothing animals and often times bring peace to people who are stressed or anxious. Not only will your dog enjoy playing with new people, but your dog will bring joy to people who may need it. This is a great way to spend some free time this summer, giving back to your community is always a good idea and it’s even better when you get to do it with your dog! Another new activity: try letting your dog your dog be in control! Take them for a walk and allow them to lead you. This could allow you both to discover new places that are close to home. Giving up control and following your dog can be very soothing for you, and your dog is certainly going to enjoy leading the way for once. This may sound like a simple activity, but the places you wind up may surprise you. It’s always fun to change up a normal walk. Just like allowing your dog to lead the way, there are many simple activities you can do with your dog close to home. Consider riding your bike or wearing roller blades while you walk your dog. This will change up a normal walk as you move at a much faster pace, which will keep things interesting and exciting for your dog. The quicker pace is also beneficial to your dogs health as they will be getting more strenuous exercise. You will also be benefitting from the exercise. 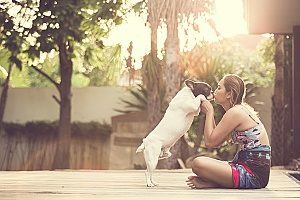 This could be a way for you to work on getting healthier while also spending quality time with your dog. Take your dog to a dog park! 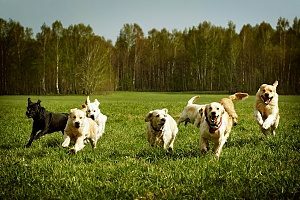 Most dogs love being social, and the perfect place for them to be social is at a dog park. You dog will be able to interact with other dogs in a safe and fun environment. Depending on the park, you may also be allowed to let your dog off their leash so they can run around to their heart’s content. This is also a great place for you to meet other dog owners. Maybe you can strike up a friendship with another dog owner and have your dogs play together. You don’t have to go out to have a great time with your dog. You could transform your backyard into your dog’s dream space. Maybe you could set up an obstacle course for them to run through or set up a small pool for them to play in. You could also use the space to teach them new tricks or teach them how to play fetch. It doesn’t matter which you choose, your dog will love spending quality time with you this summer!